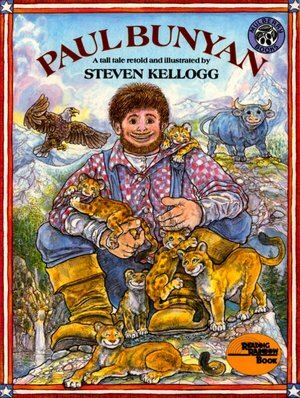 I really like a good Paul Bunyan story and have two favorites (scroll to the bottom for titles.) 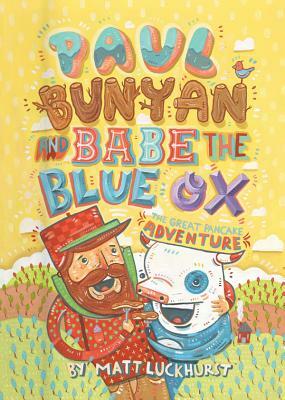 Now, after reading Paul Bunyan and Babe the Blue Ox: The Great Pancake Adventure by Matt Luckhurst, I have THREE favorites. There are some things you just have to include in a Paul Bunyan story and there are plenty of things you can shape and craft into your own story and Luckhurst does this remarkably well and with humor. On top of that, with great subtlety, he even sneaks in a little message. 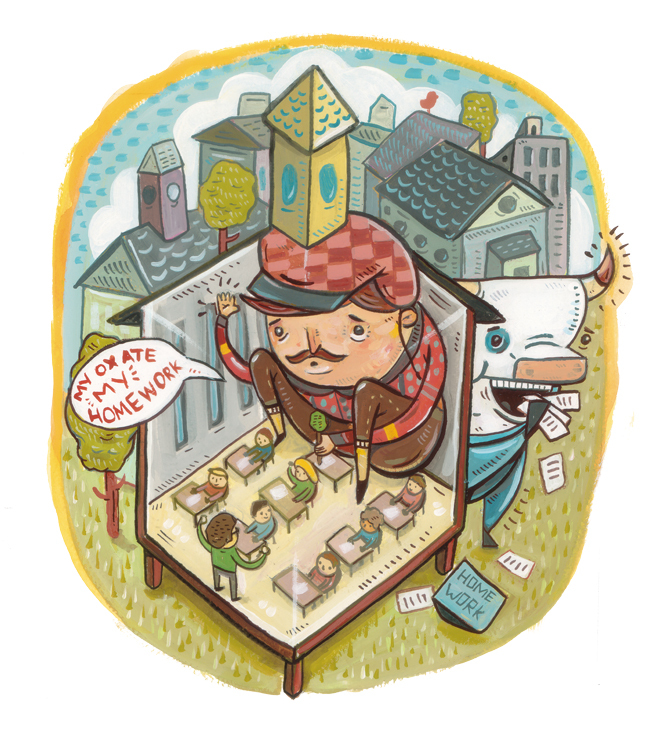 And, happily, Luckhurt's brilliant, bright, comical illustrations are perfectly paired with his subject matter. When we first meet Paul and Babe, they are eating Mom out of house and home and keeping her from her farm work with their constant demands for pancakes. At school, Paul proves not to be such a good student. Besides Babe eating his homework, he says that math "is just not that tasty." Eventually, Mom has to sit Paul and Babe down for a talk, telling them, "You have to start eating the food we GROW. You are going to get sick if all you eat is pancakes." Paul and Babe try to make the best of it, but broccoli is more than they can bear and helping in the fields, well, they are far from dainty. The friends head off for their adventures across America and are thrilled to encounter a man with a big problem down on Syrup River! A flour truck as tipped over into the river and the current is whipping up a "sizable amount of batter which had caused a log jam." 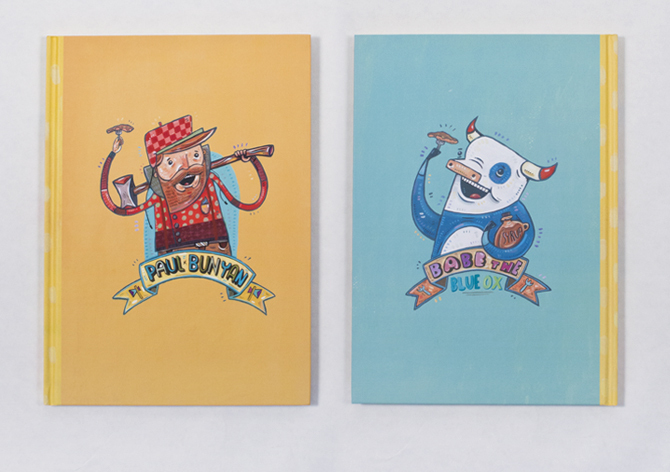 The hot summer sun starts that batter sizzling and soon Paul and Babe are bursting their buttons. They go on to work as loggers, creating the Rocky Mountains and the Grand Canyon. Luckhurst brings his own imagination to these aspects of the story to great success. 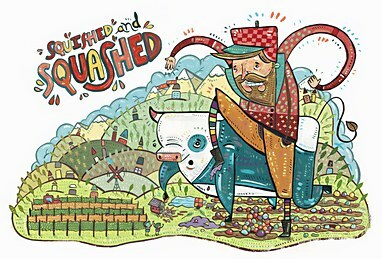 As Mom predicted, Paul and Babe do fall ill one day. A doctor explains to Paul and Babe (echoing Mom) that "they needed to balance their diet and eat different foods or they would both become even more ill." They return home to Mom (who says, "See? Your mom is always right!) 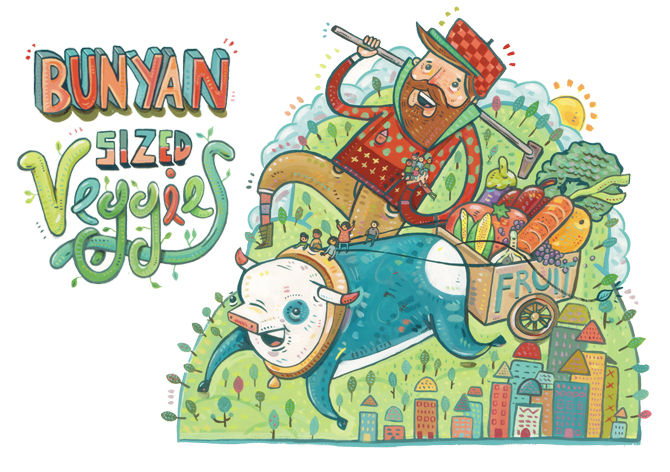 and, eventually they are growing Bunyan-sized fruit and vegetables for everyone. 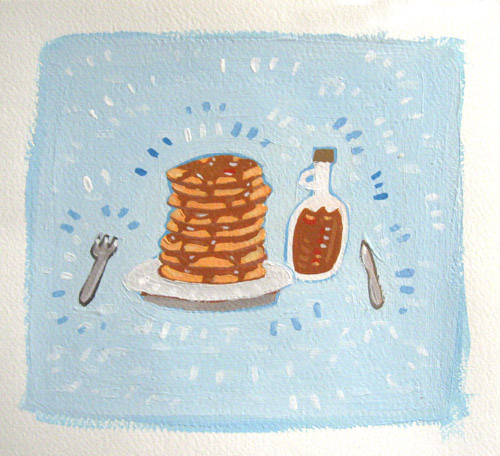 However, what I like best and what surprised me most about Paul Bunyan and Babe the Blue Ox: The Great Pancake Adventure is the author's note. Matt Luckhurst grew up on Vancouver Island in British Columbia, Canada. His grandfather was an immigrant from England who worked as a logger for many years and eventually owned his own sawmill, where Matt's father worked as well. Thus, his fascination with Paul Bunyan began. 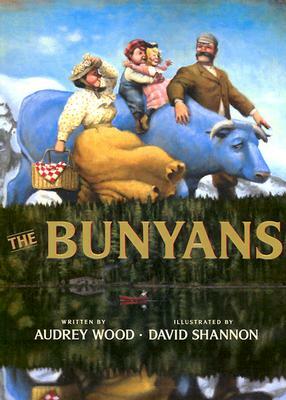 While researching this book, Luckhurst discovered that some sources say Paul Bunyan was from Canada, not America! Poring over as many stories of Paul and Babe as he could find, Luckhurst used a mix of collected tales and historical documents to "compile a story that, while unique in structure and theme, stayed true to the oral tales of Bunyan and Babe." In this, he definitely succeeded! Under the jacket flap - I love it when a publisher adds extras like this! Well done Amulet Books!